About 2 years ago Global Credit Union acquired the 5 story Freeway plaza office building at 1500 W. 4th on the west side of Downtown Spokane. The credit union has done a number of improvements to the building and now uses much of that building as it's HQ. But, Global Credit Union is planning to invest in the neighborhood as well with a couple of new projects currently in the pipeline. Just to the north of the Global HQ building plans are currently in the works to re-develop their site at the corner of Third & Walnut. Plans call for re-developing the credit union's current drive thru structure into a coffee shop , likely also with a drive thru. But, apparently further along is Global's plan to build a new 3 bay retail / restaurant strip building at the corner of 4th & Walnut, just south of the Global HQ building. They hope this new building will be built yet this year. The center would be a 4900 square foot structure with the address of 1505 W. 4th. It would be built on a mostly vacant lot the once contained a drive up coffee stand. Some new surface parking area would be added to fulfill the needs of the new buildings tenants. However, the plans have the new structure directly at the corner with parking on the side and at the rear. There is no word on who the tenants might be for this new building as it appears to be being built on speculation. The 3 tenant spaces are about 1600 +/- square feet each and one space can have a drive thru lane attached. 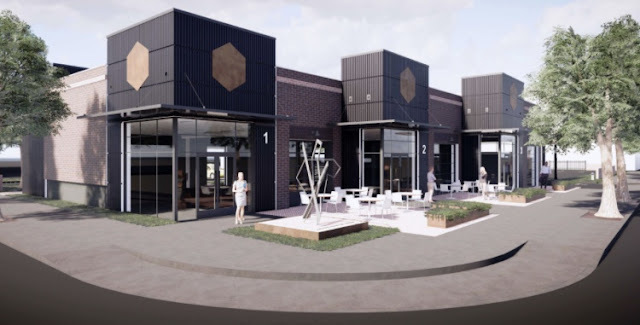 Kiemle & Hagood is already pre-leasing for the new development with the spaces leasing for $26 - $30 per square foot NNN .